Below is a screen shot of the Condé Nast international website, which shows which countries feature a 'Vogue' magazine and those that don't. I found most surprising that Canada and Africa do do not have their own issues. I also found whilst researching into each different national edition that there isn't much difference in content between cultural issues. The only changing features are food, home, travel, etc, whilst designers, models and trends remain the same or very similar, just perhaps photographed somewhere more contextual to that country. However I noticed a big cultural shift with the following issues - India, China and Japan. This is a topic I would like to look into more, as I would of thought that each magazine would vary more in context, content and culture depending the country it is published for. Full summaries for each countries website and context, can be seen below backing up the topic raised. Condé Nast first launched in Australia in 1959. Today, in partnership with News Life Media, Condé Nast publishes four leading titles on multi-media platforms. Edições Globo Condé Nast is a joint venture between the respected Brazilian media company Editora Globo and Condé Nast. Vogue Brazil launched in 1975 and was soon followed by Casa Vogue. Vogue Passarelas was launched in 2002, GQ entered the market in 2011 and Glamour in 2012. These brands have become leading titles and are pre-eminent in the local fashion and design worlds. Condé Nast publishes in Bulgaria under licence to S Media Team. Glamour launched in May 2009 and it quickly became the market leading fashion title. Condé Nast China publishes under copyright cooperation agreements with our Chinese partners. Chinese Vogue launched in 2005, becoming the cornerstone of Chinese Condé Nast Publications. 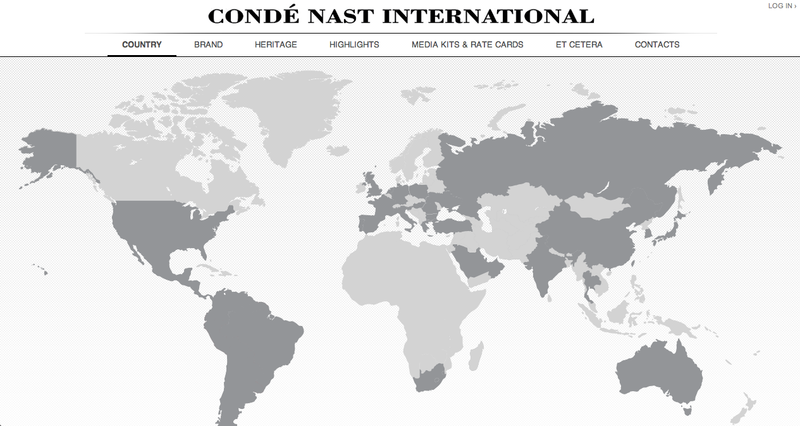 Condé Nast now produces seven of the world's leading multimedia brands for the Chinese market. Condé Nast GmbH has been Germany's leading publishing company since the launch of Vogue in 1979. Today it produces seven magazines in print and digitally, cutting-edge websites and a growing number of mobile apps. Condé Nast publishes Glamour under licence to Axel Springer Hungary, one of the largest publishing houses in the country. Glamour magazine is the best-selling fashion title in the Hungarian market. Condé Nast Japan published its first title, Vogue Japan, in 1999. Under the leadership of President Jun Kitada, Condé Nast Japan now boasts four of the nation's leading multimedia brands. Condé Nast publishes five brands in Korea in partnership with Doosan Magazine, Korea's leading media company. Vogue was launched in 1996, followed by GQ in 2001, with the Korean editions of Vogue Girl, Allure and W appearing in subsequent years. Doosan Magazine has also successfully launched these brands on multi-media platforms including digital and mobile. Condé Nast Mexico and Latin America was established in 1998 with the launch of Glamour, closely followed by Vogue in 1999. AD launched in 2000 and GQ in 2006. With a presence in eleven South American countries - from Mexico to Argentina - Condé Nast is renowned as a publisher of exceptional quality with the most influential magazines in the region. Condé Nast Traveller Middle East is published under license agreement with Arab Publishing Partners. The magazine launched in December 2013. Condé Nast publishes Polish Glamour in partnership with its licensee G + J Polska. Today the magazine is one of the best-selling women's monthlies in the country. Glamour and GQ are published under license by the Mediafax Group, who also coordinate several events associated with these market-leading brands. Vogue and GQ, two of Condé Nast's most famous fashion titles, are both published in the Portuguese market under licence to Cofina. Additionally, Sposabella Noivas is published for Portugal by Condé Nast Spain. Condé Nast launched in Russia in September 1998 with the launch of Vogue. Today Condé Nast Russia publishes seven important monthly magazines - Vogue, GQ, AD, Glamour, Tatler, Condé Nast Traveller, Allure - and two biannual publications, GQ Style and Brides. Condé Nast Russia boasts impressive audience reach across multiple platforms, including innovative apps for the iPad and iPhone. Condé Nast Independent Magazines was established in 1997 and is a licensee of Condé Nast International. The company has a reputation for quality publishing in South Africa and today boasts three of the country's leading media brands; Glamour, GQ and House & Garden. Key standalone brand extensions - GQ Style and Glamour Hair - were launched in 2012. Established in 1988 with the launch of Vogue, Condé Nast Spain has since expanded to publish nine leading titles. Under the leadership of President Javier Pascual del Olmo, the company has built world-leading multimedia brands spanning print and digital publications as well as highly acclaimed websites and apps. Condé Nast Taiwan was established in 1996, with the simultaneous launch of Vogue and GQ, both today supported by dedicated websites. The company launched a Wired website in January 2012. Vogue Thailand is published in partnership with Serendipity Media and was launched in February 2013. Condé Nast forged a partnership with G+J Uitgevers in 2005 with the launch of Glamour, followed by Vogue in Spring 2012. Condé Nast launched in 2010 in partnership with Doğus Media Group, which is one of Turkey's leading multi-media companies. Vogue was first published in 2010 and GQ launched in 2012. Vogue Ukraine launched in March 2013 and is published in partnership with UMH Group. British Vogue published its first issue in 1916, becoming the cornerstone of Condé Nast in the UK. Today, under the leadership of Managing Director Nicholas Coleridge, the company publishes thirteen of the world's leading multi-media brands and in April launched the Condé Nast College of Fashion & Design.